My friend & I were drunk-discussing the nature of reality, the mind, & the human experience after we got back from the bar last night (what else is there to talk about when you're inebriated?!?). He was saying that humans are self-contained entities, and in the end all we ever experience is our own mind. It is true, that every sensory experience and thought that we ever have is nothing but a lightshow in our own head. However, I also believe the universe/mind is a continuous and complete fractal, holographic phenomenon. 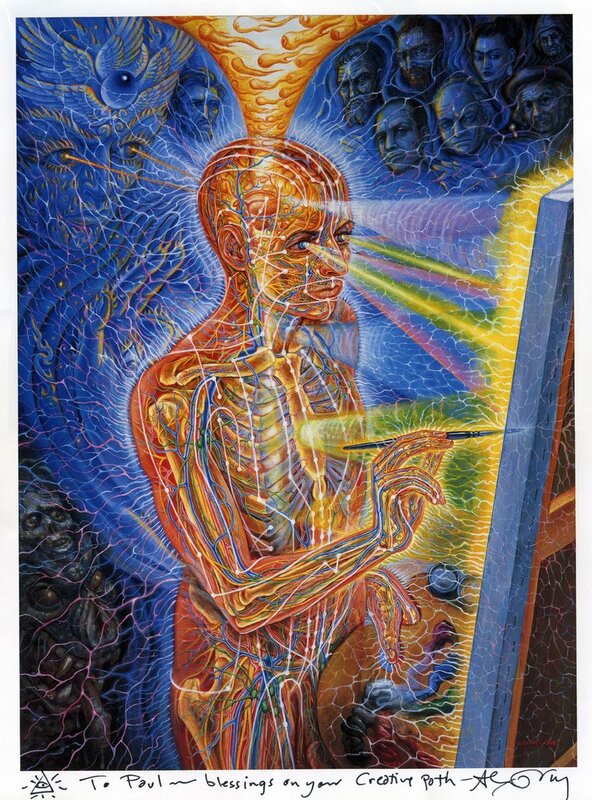 Therefore, levels of interconnectivity and synchronicity outside of the human experience should be expected. Of course, no symbolic grunt that can be uttered by a physical being can really be expected to accurately represent anything. For a more accurate description of the nature of the human experience, click Here. 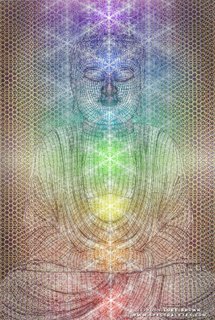 "As the religions of the East have long upheld, the material world is Maya, an illusion, and although we may think we are physical beings moving through a physical world, this too is an illusion. We are really 'receivers' floating through a kaleidoscopic sea of frequency, and what we extract from this sea and transmogrify into physical reality is but one channel from many extracted out of the superhologram." "Pribram believes memories are encoded not in neurons, or small groupings of neurons, but in patterns of nerve impulses that crisscross the entire brain in the same way that patterns of laser light interference crisscross the entire area of a piece of film containing a holographic image. In other words, Pribram believes the brain is itself a hologram." This is kind of crazy... seeing color photos of life in the 20's & 30's makes the people and scenes seem much more real. Here's an overview of the exhibit. Take a good look... the Bush Cartel is leading America down a very beaten path that hasn't been travelled in almost a century. Check out this Quicktime VR of the view from inside a water cooler bottle. Update: "Da Vinci's Challenge Articles"
I added some new links to more articles featuring the "Da Vinci's Challenge" game. Wow!!! There is an article on the UK's Scotsman.com about a hyperspace engine being developed by the U.S. government that uses magnetic fields to warp gravity & space-time, which would shift a craft to another dimension - where otherwise impossible speeds can be attained! We are living in a time where people still believe that Genesis is literally true, yet we are also investigating inter-dimensional travel!!!... No wonder the world seems like it's going insane. 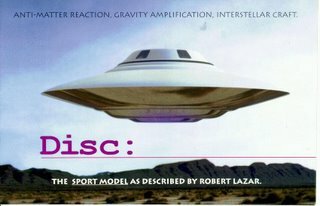 The really interesting part, for me, is the fact that when I was younger I had a UFO model kit based on the descriptions of Bob Lazar, who claims to have worked at Area 51 reverse-engineering alien spacecraft. It came with an awesome booklet that described, according to Lazar, how the ship's *gravity propulsion* system worked. Maybe the stories of Area 51 and the Philadelphia Experiment aren't so far-fetched after all. Here's a page that has the explanation & scans from the booklet. Click here to see more links (scroll down a bit). Anyway, the very patriotic Jesus' General has obtained an exclusive scan of this elusive document!!! 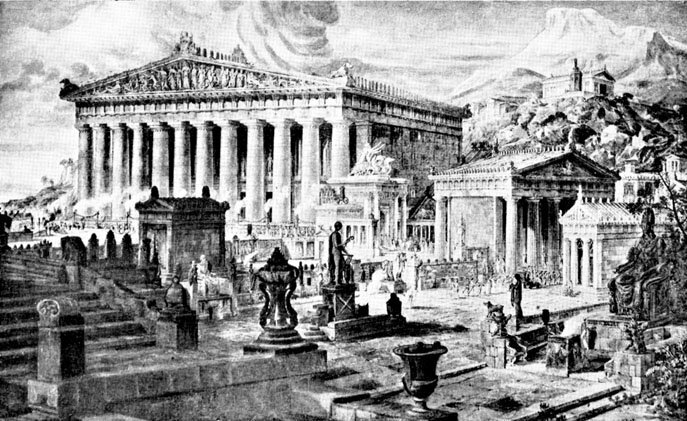 "Some scholars believe that the power of the Eleusinian Mysteries came from the kykeon's functioning as a psychedelic agent; this was argued most extensively in The Road to Eleusis, by R. Gordon Wasson, Albert Hoffman, and Carl A. P. Ruck. Barley may be parasitized by the fungus ergot, which contains LSA, a precursor to LSD. It is thus possible that the initiates, sensitized by their fast and prepared by preceding ceremonies, were propelled by the effects of a powerful psychoactive potion into revelatory mind states with profound spiritual and intellectual ramifications. " Albert Hoffman, the discoverer of the psychedelic compound lysergic acid diethylamide (LSD-25), is really old. 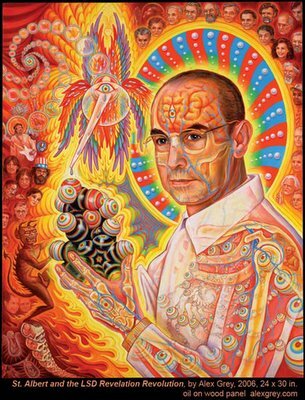 "Nearly 100, LSD's Father Ponders His 'Problem Child'"
I just think it's easier for creative people to toss aside the man-made arbitrary rules & norms of society... because they tend to think "outside the box" and challenge the boundaries of experience. "The Pentagon has no accurate knowledge of the cost of military operations in Iraq, Afghanistan or the fight against terrorism, limiting Congress's ability to oversee spending, the Government Accountability Office concluded in a report released yesterday." This fall, voters should just clean house by voting out any incumbents in Congress who aren't dealing with these important issues. "The exit polls showed Kerry winning in Ohio, until an unexplained last minute shift gave the election to Bush. 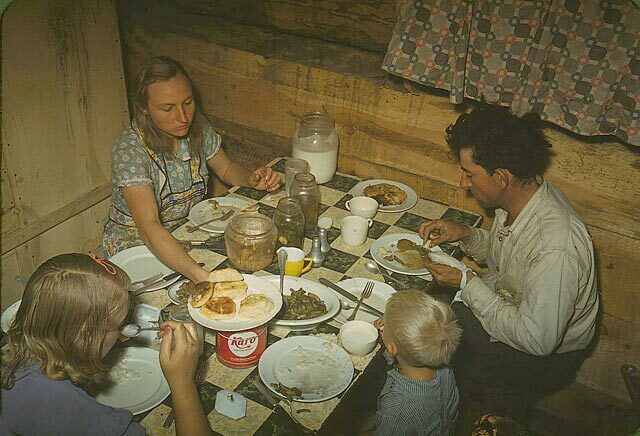 Similar definitive shifts also occurred in Iowa, Nevada and New Mexico, a virtual statistical impossibility." The last bit is why I never accepted the fact that The Smirking Chimp won the last election. I watched with my own eyes that night, as I stayed up watching the election coverage, the results of the exit polls showing Kerry winning completely reverse when the numbers started coming in. The media started blaming the exit polls, and I realized Grand Theft America II had occured. The real kicker came after the "Orange Revolution" took place in the Ukraine when the exit polls and vote counts didn't match up. In that case, everyone agreed that the election had been stolen!!! But whatever... let Dubya & Darth Cheney run the country into the ground!!! That will make it easier for Americans to remember never to allow fascism again, and to never support anyone from or associated with the Bush Cartel ever again. "Introverted children enjoy the internal world of thoughts, feelings and fantasies, and there's a physiological reason for this. Researchers using brain scans have found introverts have more brain activity in general, and specifically in the frontal lobes. When these areas are activated, introverts are energized by retrieving long-term memories, problem solving, introspection, complex thinking and planning." "He who knows, does not speak. He who speaks, does not know." This is a segment that was on Tucker Carlson's show on MSNBC that I watched when it aired. If you have trouble believing that government officials, foreign agents, and elements of the military-industrial complex wouldn't commit a criminal conspiracy against our own people... well, you just need a little historical perpective, that's all. "The plans were developed as ways to trick the American public and the international community into supporting a war to oust Cuba's then new leader, communist Fidel Castro. America's top military brass even contemplated causing U.S. military casualties, writing: 'We could blow up a U.S. ship in Guantanamo Bay and blame Cuba,' and, 'casualty lists in U.S. newspapers would cause a helpful wave of national indignation.'" 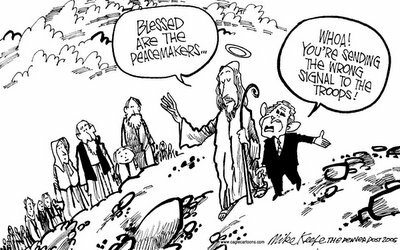 A Who's Who of current government hardliners and 'neoconservatives' who's vision of America stinks of fascism and imperialism. "According to their own document, their stated goals would not be realized “absent some catastrophic catalyzing event –like a new Pearl Harbor”." Deep Thoughts by Jack Handy was one of my favorite SNL skits. in every culture, is the story of Popeye." "To me, clowns aren't funny. In fact, they're kind of scary. and a clown killed my dad." "When I was a kid my favorite relative was Uncle Caveman. and every once in a while he would eat one of us. that Uncle Caveman was a bear." "I wish a robot would get elected president. we could all take a shot at him and not feel too bad." I bet you could shoot beer out of you nose." or it'll turn into a fossil." It's a mystery, and that's why so is mankind." ...Damn, just found more "Deep Thoughts"! This is pretty crazy, especially because it plays the wacky music from Pee-Wee's Big Adventure. I figured I'd start the New Year off with some wishful "humor" about the Worst President Ever. "President Bush Converting 'West Wing' to 'Arrest Wing'." This amazing reporting was done by everyone's favorite tabloid, The Weekly World News. 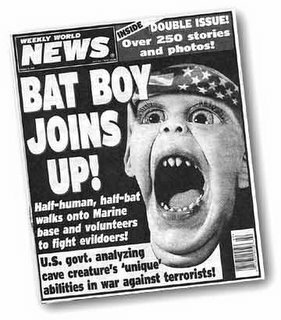 Would the people who brought us 'Batboy' report anything but verified facts?